HONOLULU — The Hawaii Department of Transportation (HDOT), in conjunction with the Nisei Veterans Legacy (NVL), is proud to unveil the new permanent exhibit celebrating the Nisei veterans of World War II. The unveiling was commemorated with a ceremony today at the exhibit site located at the Honolulu International Airport in the makai end of the Interisland Terminal near gate 56. The exhibit was produced by volunteers from the Nisei Veterans Legacy, a nonprofit organization created to preserve and perpetuate the legacy of the Americans of Japanese Ancestry who served in the United States armed forces during World War II, including the 100th Infantry Battalion, 442nd Regimental Combat Team, Military Intelligence Service and 1399th Engineer Construction Battalion. Funding for the exhibit was provided in part by a grant from the Hawaii State Legislature for the construction of the display cabinet. The contents were produced or donated by the NVL. 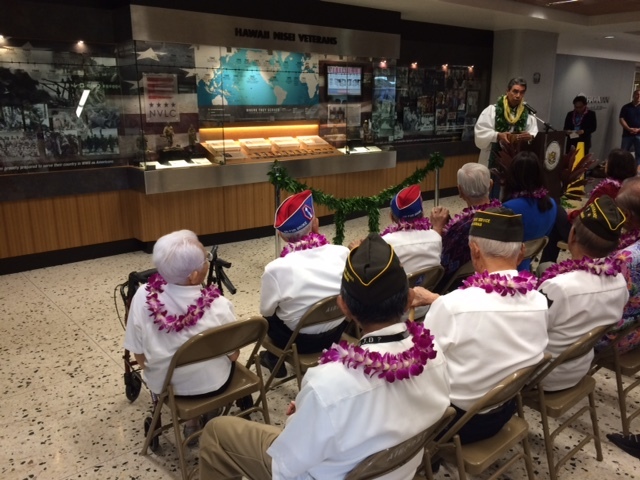 The distinguished veterans watch as the new Hawaii Nisei Veterans exhibit at the Honolulu International Airport is blessed by Kahu Wendell Davis. 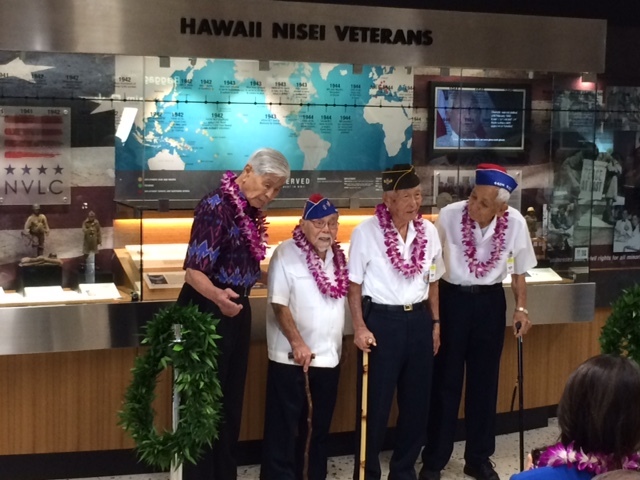 Honored veterans from left to right: Governor George Ariyoshi, Kenji Ego, Herbert Yanamura, and Robert Kishinami.